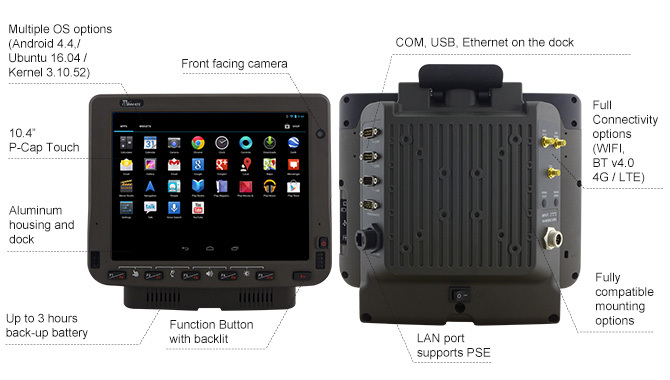 To meet our customers' diverse needs for flexibility, Winmate has upgraded the FM10- 10.4" Vehicle-Mount Computer to support Android 4.4 in addition to Windows OS. This allows our customers to reduce learning curve as many of their workers are already savvy users of Android based smartphones and tablets. This also helps to reduce development costs and speed of implementation. Windows OS is still available for enterprise solutions and remains a reliable platform for vertical and industrial markets. The FM10 is primarily designed for applications that use touch input on a large display, but also benefit from a number of readily accessible and programmable function keys. 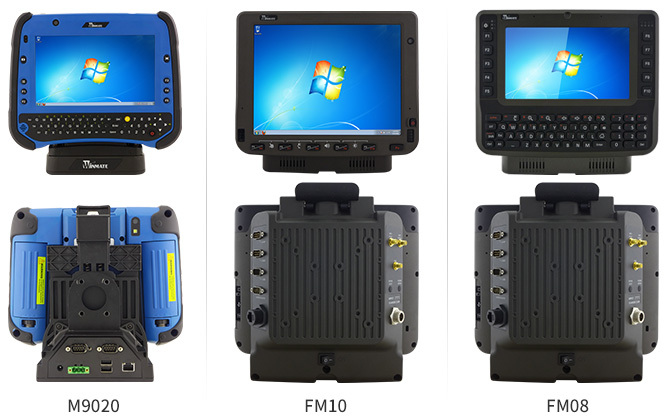 The FM08 and FM10 offer the choice of an 8" screen with keypads or an 10.4" screen with function keys. Both devices share system and docking modules for convenience when multiple devices are in use. Almost all consumer products now us the effortless and elegant capacitive multi-touch. Winmate chose a resistive digitizer for Windows OS (FM10 or FM08). The FM10A runs Android 4.4 with capacitive multi-touch. FM10-FM08 feature Intel "Bay Trail" Atom E3845 1.91 GHz quad-core processor.The FM10A operates on the Freescale Cortex A9 i.MX6 Dual Core 1GHz processor. Robust processing power coupled with the fanless design ensure low-power consumption without compromising speed. Vehicle-mount panel computers have different requirements than consumer mobile systems as they are subject to vibration, shock, and other harsh conditions. The FM's -22 to 122 degree Fahrenheit operating temperature range allows deployment in a vast range of environmental conditions, including industrial freezers. As vehicle-mounts may be operated outdoors, FM units have an IP65 ingress protection rating indicating the unit is fully dustproof and capable of withstanding low pressure jets of water.